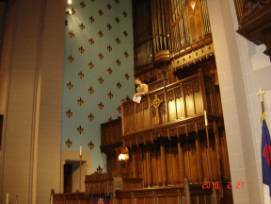 Stephen Warner speaks from the organ and choir loft over the altar. 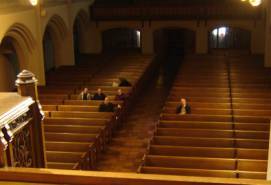 The view from above shows the broad expance of the sanctuary. 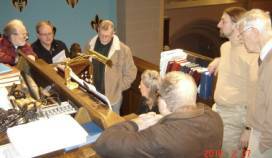 The OHSers gather around the Skinner organ console. 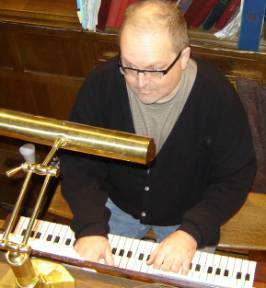 Jim Wilkes shows great form at the console. The view from below shows the organ and its console high above the altar. Ray Ahrens enjoys his turn at the big Skinner. 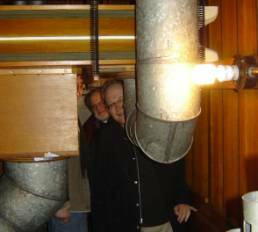 Ken Holden and Terry Jankowski peer from behind an air duct in the spacious pipe chamber. 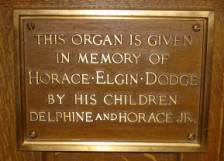 The February 2010 meeting of the Michigan Chapter of the Organ Historical Society convened at the Jefferson Avenue Presbyterian Church (JAPC) in Detroit, Michigan. Present were Ray Ahrens, Carl Balduf, MaryAnn Balduf, Kenneth Holden, Terry Jankowski Brian Sweetman, Jim Wilkes and Stephen Warner, JAPC Organist, who hosted the meeting. Balduf called the meeting to order at 10 a.m., following that with a request for approval of the minutes, which carried unanimously. Discussion then ensued concerning the April 10 meeting at Hope College in Holland, Michigan, and whether anyone would be interested in arriving on Friday evening, April 9. Hotel availability and costs were discussed, with Balduf saying he would look into this and report back. 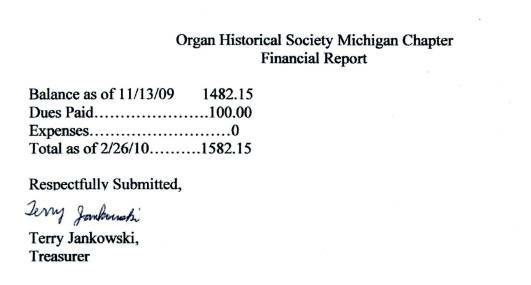 Later, Terry Jankowski presented the treasurer's report, which can be found below. There being no further business, the meeting was adjourned at 10:10 a.m. Following the meeting, Stephen Warner presented a Powerpoint presentation that detailed interesting history about the church building and the exceptional 68 Rank Skinner pipe organ in the sanctuary. 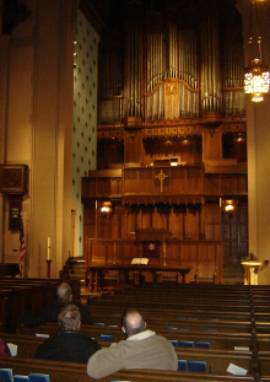 Subsequently, the group moved from the Dodge meeting room to the sanctuary, where Warner showed off the organ’s capabilities through several stirring organ performances. 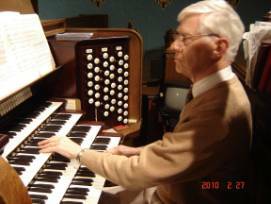 Warner then invited all to play the organ and/or investigate the spacious organ chambers. The group adjourned about noon, for lunch at Sindbads on the Detroit River. By the looks of it, a happy meal was had at Sindbads (sic) by (l-r) Carl Balduf, MaryAnn Balduf, Ray Ahrens and Jim Wilkes. Stephen Warner (far right) delivers an historical presentation about the church and the Skinner organ. Watching, from left, are Ray Ahrens, Jim Wilkes, Ken Holden, Brian Sweetman, MaryAnn Balduf and Terry Jankowski. 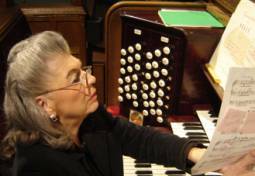 MaryAnn Balduf checks the score and registration at the Skinner console.